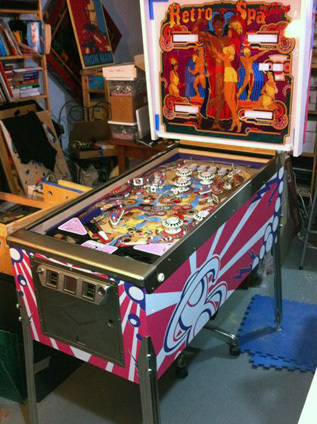 Retro Spa is a newly-built custom pinball machine, using a mix of vintage and reproduction playfield machinery (Bally, Williams and Gottlieb) with new microcontroller electronics, and original artwork inspired by a classic game. A computer simulation, with a physics engine and accurate topographical table layout, was used to help develop the game rules, scoring and other functionality. 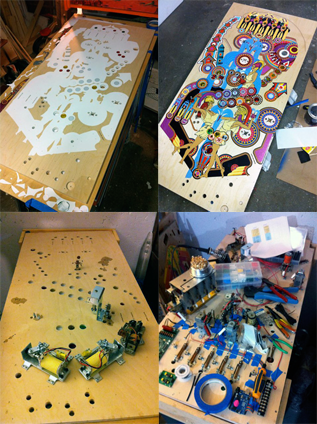 Like previous custom games, this pinball was designed to look and play like a vintage 70's to 80's machine. However, the specific challenge for this machine was to show that a wide-body table could be re-designed to standard size while maintaining the features, feel and game play of the original. 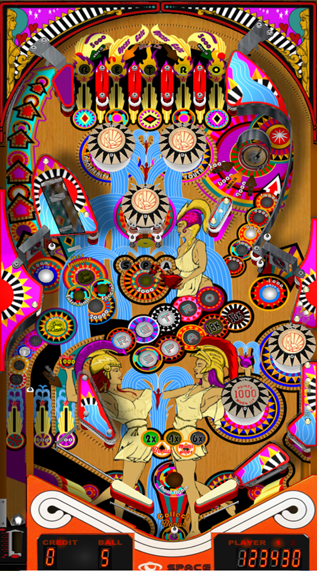 As a bonus, the artwork was based on concept sketches that were rejected over thirty years ago, making this both an "alternate history" prototype as well as a tribute to one of the all-time-great pinball artists. Like Jupiter Crush , some of the electronic circuits are unique and highly customized, while others are off-the-shelf from PinScore, MultiMorphic or Arduino. GAME CONTROLLER: Arduino Duo with custom firmware and USB interface for programming. This device reads the switches, keeps score and communicates with other boards that perform simpler interface tasks. SOLENOID DRIVER: 24V output using a Power Driver 16 from Multimorphic on an SPI interface to the main Game Controller. LIGHTING DRIVERS: Custom Space-Eight design with a serial UART to the main Game Controller. SCORE DISPLAY: PinScore LED displays with an Arduino Duo interface that communicates via I2C to the main Game Controller. This game was designed entirely as a computer simulation first, then exported into CAD and fabricated using a combination of vintage, reproduction and custom parts. 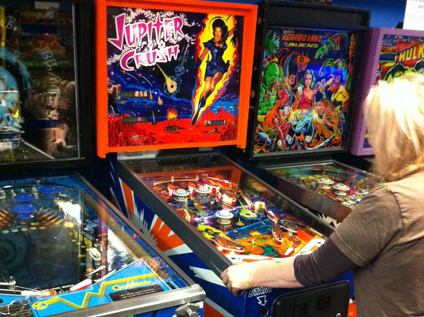 The virtual portion of the game was designed using Visual Pinball (VP) software, a copy of which can be found here, and is freely available to play on a personal computer. The cabinet for Retro Spa was designed and built from scratch. Inspired by the old-school low-sloping style from the '60's and '70's, but with the practicality of a shallow head found on newer games. The head piece still retains angled edge trim reminecent of older-style games. The backglass continues the theme from the playfield, with artwork on a mylar translight behind 1/4" acrylic. Completed and installed at the Seattle Pinball Museum on mm dd, yyyy. TBD text, Custom Pinball Exhibit here. 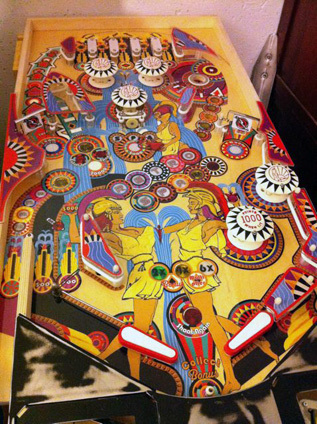 This game was designed first as a computer simulation, before being brought to life as a physical real-world pinball machine. Implemented using Visual Pinball (VP) software, a copy of the table can be found here, and is freely available to download and play on a personal computer. Enjoy!